BANGALORE, India — India's 4.5 billion rupee ($73.5 million) mission to Mars, the nation’s first true interplanetary probe, is now slated to lift off Nov. 5 at 2:36 local time from the Satish Dhawan Space Centre in Sriharikota, the Indian Space Research Organisation (ISRO) announced Oct. 22. The launch of the 2,976 pound (1,350 kilogram) Mars Orbiter Mission aboard an enhanced version of ISRO’s Polar Satellite Launch Vehicle had been scheduled for Oct. 28, but was delayed because ships equipped to track the spacecraft after its separation from the rocket could not take up their designated positions in the south Pacific Ocean in time due to bad weather. The spacecraft, dubbed Mangalyan, has been mated with the launcher and the heat shield has been closed, ISRO said. If everything goes according to plan, Mangalyan will leave Earth orbit in November and cruise in deep space for 10 months using an onboard propulsion system before entering into a 231 mile (372 kilometers) by 49,709 mile (80,000 kilometers) elliptical orbit around Mars. 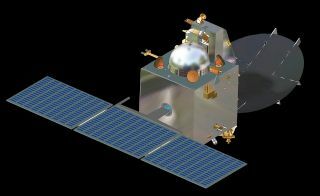 ISRO says the primary objectives of the orbiter are to demonstrate India’s technological capability, look for signs of life and study the planet’s atmospheric composition.